Get clean, powerful low-end punch in a lightweight, portable subwoofer. SA Sub provides enhanced SA300 bass response as part of a clean interconnected system. Voiced to complement the SA300, the compact and lightweight SA Sub can provide enough low end to fill a 150-person room. For bassists, DJs, presenters and others looking to add enhanced low-end punch to their performances and other broadband program material, the SA Sub is the answer. 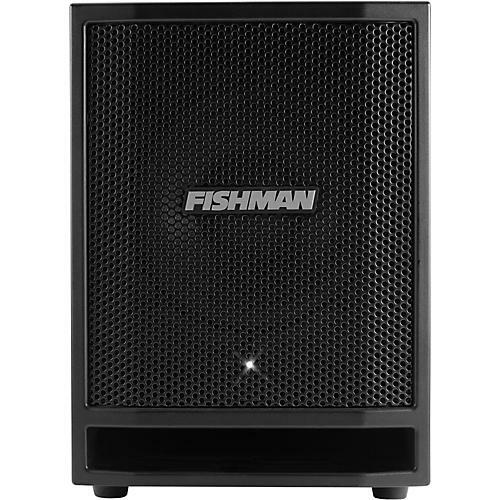 A purpose-built subwoofer intended for small‐to‐medium size performance applications, the SA Sub is the prefect solution where portability and Fishman-quality sound are essential. The SA Sub is designed as a companion to the SA300 main unit and connects easily via a 1/4-in. / XLR connector. Additional features such as Phase Reversal switch, signal limiting, level indicator, Ground Lift switch and more, insure minimal feedback and quiet, clean performance. Dimensions: 10.3 in. x 14.4 in. x 19.8 in.